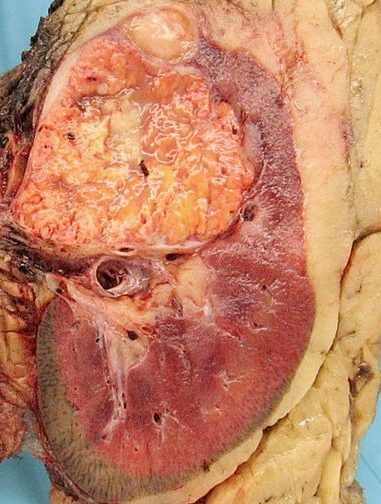 Renal cell carcinoma (RCC) is the most common form of adult renal tumour. It is the ninth most common cancer worldwide and constitutes 2-3% of all cancers. There is a higher incidence in developed countries and RCC is 1.5x more common in men, with a peak incidence 50-70yrs. It accounts for 85% of all renal malignancies, with 1-2% of RCCs bilateral at diagnosis. Other renal malignancies include transitional cell carcinoma (urothelial tumours), nephroblastoma in children (Wilm’s tumour), and squamous cell carcinomas (chronic inflammation secondary to renal calculi, infection and schistosomiasis). This article will discuss the presentation, investigation, and management of renal cell carcinomas. RCC is adenocarcinoma of the renal cortex, arising predominantly from the proximal convoluted tubules, most often appearing in the upper pole of the kidney. Microscopically, they are mostly composed of polyhedral clear cells, with dark staining nuclei and cytoplasm rich with lipid and glycogen granules. RCCs can spread through direct invasion in to perinephric tissues, adrenal gland, renal vein* or the inferior vena cava. RCC can spread via the lymphatic system to pre-aortic and hilar nodes, or by haematogenous spread to the bones, liver, brain and lung. The most common risk factor is smoking, doubling the risk of developing the condition. Other important risk factors include industrial exposure to carcinogens (such as cadmium, lead, or aromatic hydrocarbons), dialysis (30x increase); hypertension; obesity, and anatomical abnormalities such as polycystic kidneys and horseshoe kidneys. Certain genetic disorders can also predispose to RCCs, such as von Hippel-Lindau disease (associated with bilateral multifocal toumours), BAP1 mutant disease, and Birt-Hogg-Dube syndrome. The most common presenting complaint* for RCCs is haematuria, either visible or non-visible. Patients may also report flank pain, flank mass, or non-specific symptoms, such as lethargy or weight loss. Around 50% of diagnosed RCCs are detected incidentally on abdominal imaging. The classic triad of haematuria, mass, and flank pain is only present in 15% of cases. 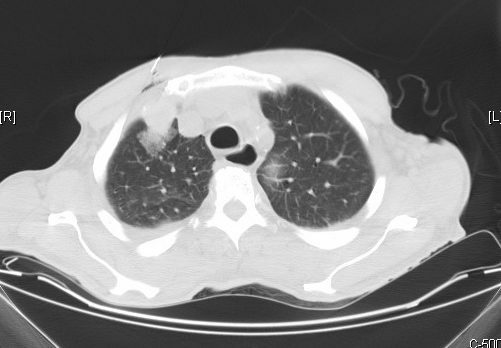 On examination, large RCCs may be able to be palpated in the flank or hypochondrial regions. Left-sided masses may also present with a left varicocoele, due to compression of the left testicular vein as it joins the left renal vein. Initial routine bloods tests should include full blood count, urea & electrolytes, calcium, liver function tests and C-reactive protein. Urinalysis should be formed for evidence of non-visible haematuria and urine should be sent for cytology. Currently no serum tumour marker is available to aid in the diagnosis of renal cell carcinoma. 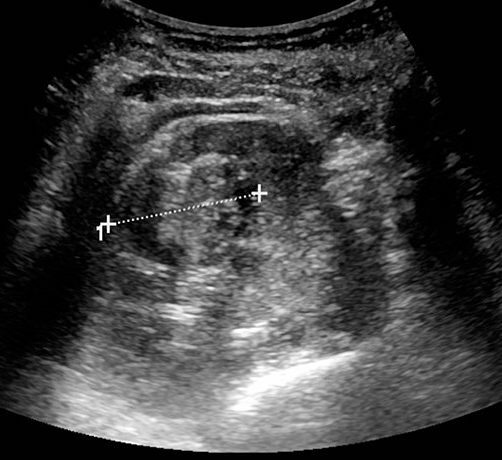 As for most cases of haematuria, initial imaging through ultrasound (Fig. 3) or CT scanning is essential in the work-up of such suspected cases. However, CT imaging of the abdomen-pelvis pre and post IV contrast is the gold standard for suspected cases, with an additional chest for staging once the condition is confirmed. There is a role for biopsy of renal lesions, particularly small renal masses when surveillance or minimally invasive ablative therapies are being considered. For smaller tumours, a partial nephrectomy may be suitable; for larger tumours, a radical nephrectomy may be required, to remove the kidney*, perinephric fat, and local lymph nodes en bloc. For those not suitable or fit enough for surgical management, percutaneous radiofrequency ablation or laparoscopic/percutaneous cryotherapy may be considered. Renal artery embolisation may be required for haemorrhaging disease, prior to any radiofrequency ablation, or for unresectable palliative cases. Chemotherapy is considered generally ineffective in patients with RCC. In otherwise fit patients with metastatic disease, nephrectomy combined with immunotherapy (such as IFN-α or IL-2 agents) is often recommended. Metastasectomy (surgical resection of solitary metastases) is recommended where the disease is resectable and the patient is otherwise well. Approximately 25% have metastasis at presentation. Survival for patients who have undergone nephrectomy is around 70% at 3 years and 60% at 5 years, however those with worse stage disease have a poorer prognosis. At what vertebral level do the renal hilum typically lie? 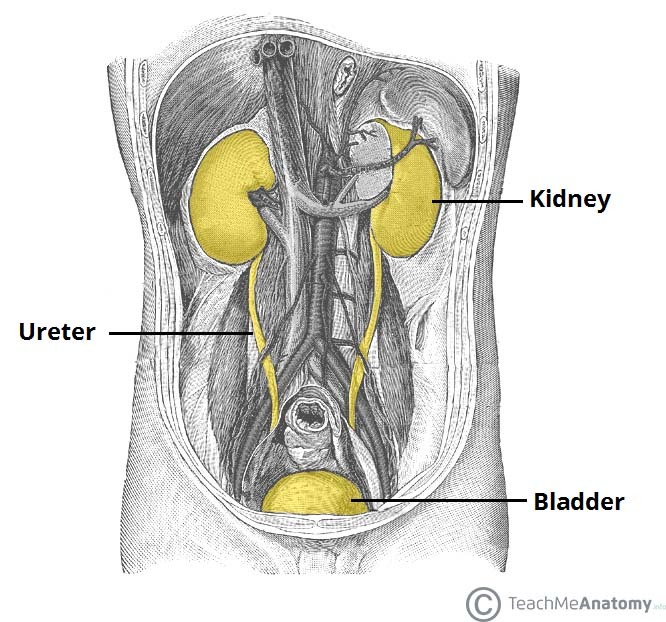 Which is the most common type of renal cancer? By what excess hormone secretion do renal cancers result in hypertension? As per the AJCC staging classification, a renal cancer invading the renal capsule but confined within Gerota’s fascia is which stage? Approximately what proportion of RCC patients have metastasis at presentation?